Rachel Gibbens led the way for Marshall Milton Keynes Athletic Club by taking gold in the South of England track & field Championships. After her successful start to the season the previous week when she cleared 3.50m in the pole vault, Gibbens went even higher to 3.80m to take the title at Lee Valley. Naomi Greener took silver in the under 20 long jump moving up from the bronze medal position to silver with her third jump of 5.08m and then, in the same age group, a huge personal best of 48.81m from Laeken Impey saw her winning hammer bronze adding 1.36m to her PB. This distance also places Laeken fourth in the ladies all-time hammer rankings. Kayleigh Presswell is the club record holder in the hammer and is gradually getting back to form. She threw 49.79 for fourth position in the senior event whilst club-mate, Emma Beardmore placed fifth throwing 45.77m, her second best distance in 2015. Still in the throws, Jackson Curtis threw the javelin 62.86m, just down on his season’s best for fourth place. Competition in the sprints is always a tough prospect at these championships but both Subomi Onanuga and Aaron Adom acquitted themselves well. Adom placed third in his semi-final of the 200m with a personal best of 21.96 whilst Subomi was just off his season’s best with 10.98 in his semi-final. The other top six finisher was Lara Bromilow, 5th in the 3000m recording 10.12.56 for a season’s best. MMKAC runners have supported the annual Dartmoor Discovery 32mile-ultra for many years. Around the undulating course Gary Blaber made his debut and ran to a superb 4th place with a best-ever time by a MK runner, 4hours00.10. Julie and Neil Jones have a number of completions to their credit but just ahead of them was another newcomer, Alexandra Tvarozkova who finished 53rd from the 200 strong field in 5:11.50. Julie and Neil ran together, finishing 95th in 5:29.42. In the St.Albans half-marathon Michal Glowicki finish 3rd (73.06) and Nadine Lewycky 31st and 2nd lady (84.59). Ursula Ghaleb was 6th F55 (2hours, 13). 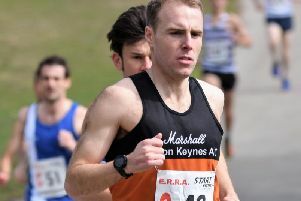 Brian Gilks, MMKAC’s oldest competitive runner improved his M80 club record for the half-marathon clocking 2:52.21 at Market Harborough, improving by four minutes.